You will probably want to stick with a glass adhesive. Because: these products are made to mate glass to other objects like wood, crystal, and metal. Hence, our Top Seven Glue For Glass Picks might have a binder you want for your home and office projects. You may even like a few of our products because they have a variety of features. 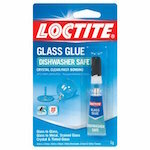 The phrase, “dynamite comes in small packages,” comes to mind with the Loctite Glass Glue. This binding agent may have all the benefits you want in an adhesive. We like this product because you can use it on items that will go in the dishwasher. You will easily recognize this product with the red banner across the top of the package. It has the Loctite logo in this area with a bright, blue color on the lower two-thirds of the package. 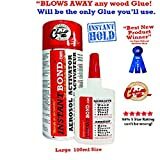 This glue will dry clear; therefore you may use it on white or opaque items with no worries of it clouding up your favorite knick-knack or picture frame. The manufacturer says to hold the pieces you glue together for about a minute without wiggling them or trying to adjust the position. After bonding, you will want to put the item up to sit for at least an hour if you cannot wait until the next day. 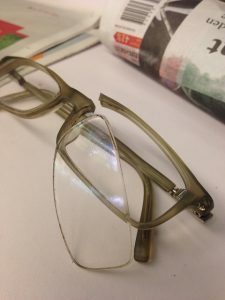 The versatile glue allows you to connect clear or glass objects with color to each other or surfaces like steel that is solid and will not soak up the material. We think that the most noteworthy part of this glue is that it does not yellow over time; therefore you can use it on clear objects that you want to remain sparkly and clean. Do you need a tube of glue that you can use on many surfaces including glass? Do you like to repair things to save a little money on replacement items? 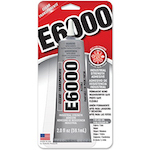 Our editor’s choice is the E6000 Craft Adhesive. It is our top pick because we think you might find this option versatile and forgiving should you get the mirror out of place on the first try. When you make a mistake, or you are not sure that you can hold the pieces in place, this adhesive gives you the chance to adjust the object with a five-minute curing time. The two-ounce package is recognizable with a bright red band across the top of the package. The bottle is gray and has a “Best for creating,” seal on the label. We like that this adhesive is flexible letting it move with cloth items. You can use this glue on picture frames with no fear of damaging your favorite family photo. The adhesive is photo safe should you decide to use it to glue pictures to a background. You can paint over this glue when the finish is set. 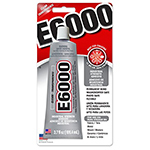 Furthermore, the E6000 glass adhesive comes from a manufacturer in the U.S. helping you feel proud to support American products. This adhesive is one of our favorite choices because it is forgiving. We feel that you may like this binding agent for fixing tears in leather purses and bags. You might use it to attach sequins to a pair of jeans instead of paying designer prices. In conclusion, we recommend this glass glue for any item where you need a clear adhesive like reattaching a broken wine glass stem. 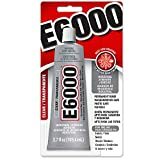 If you spend your free time making gifts for others, then you may like that the larger bottle E6000 glass glue gives you the opportunity to make dozens of projects. The bigger container seals tight so that you can keep the glue pliable when you do not use it for a while. We like that you can use this adhesive on items that you intend to wash and dry. This adhesive works well on metal, leather, cloth, plastic, glass, ceramic, and vinyl items. One of the most relevant tips when using this glue is to remember that it takes a full five minutes to harden. Once the glue is dry, we think you may get the best results when you set the item aside for two to three days before using. We like that this glue is acceptable for objects that you will use around heat. For instance, a broken handle on your coffee cup will hold up well once you let the cup cure. Consequently, you may microwave the cup to reheat the coffee without worry that the handle will fall off when you choose this glue. Do you find yourself needing a glass glue that sets up fast? Do you want a product that does not require for you to hold the broken pieces together for five or ten minutes after applying the adhesive? Gorilla Glue is meant to provide a secure bond. We like that it takes less than a minute for this glue to cure. 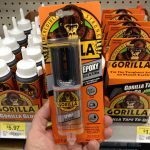 This item is easy to find in the hardware store with the bright orange label and the gorilla holding a sign with the logo on the front of the package. 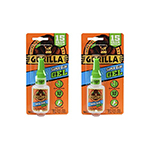 We think that you might find the Gorilla Super Glue Gel a welcome addition to your workshop, craft room, office, or home because it not only binds your items so that you can use them again, but it makes the fix stronger than the surrounding material. You may find that no clamping makes this glue even more appealing. The manufacturer says to get the glue into the tip that you should shake the bottle while it is upside down and gently tap it on a table or other hard surface. Gravity will bring the gel into the tip. You may like that we feel the most noteworthy aspect of this item is that it makes any bond stronger whether on fabric, glass, or metal. Do you need an adhesive that you can keep in your boat, truck, barn, or shed? Do you have projects all over the place? Perhaps, your work requires constant gluing or using adhesives, and you might benefit from an item that you can use on many materials. The Instantbond glue is one product we feel that you may like for everyday use. This product bonds many materials together, however, our favorite part is that this adhesive is safe for plastics. If you make crafts, then this glue might be the best item for large or heavy objects. Because of the bonding strength of this product, you might find it surprising that you can use this glue for heavy countertops like stone and marble. 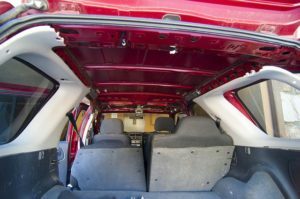 The adhesive can even keep trim on a vehicle, and as a result, it works well in household construction projects. Since you do not have to clamp the broken items together when using this product, you may find that this adhesive is very user-friendly. The Instabond Super Glue is an award winner, so you may appreciate that this one is on our Top Seven list. 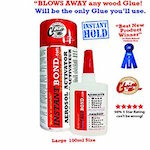 Do you need a glue that will work on many surfaces including Styrofoam? 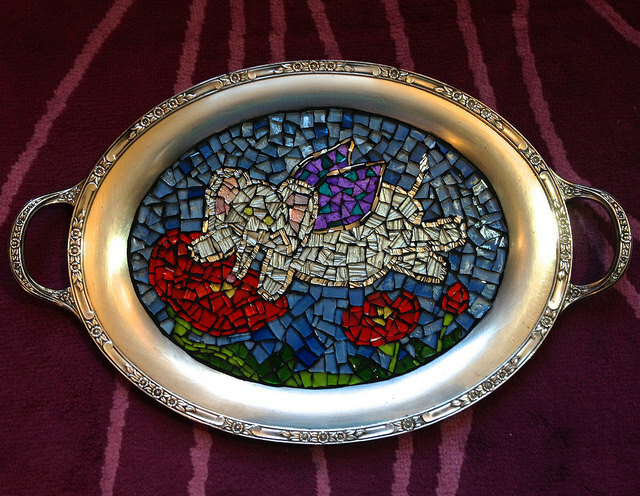 Do you work with clay, tile, or glass a lot? If using products that are not harmful to the environment is important to you, then you might be happy to find out that this adhesive has no formaldehyde or dangerous metals. Furthermore, no animal testing is part of the manufacturing process for Weldbond products. You might find that this glue is easier to clean up should you make a little mess because it is water soluble. You may add a little water to the glue when it begins to harden to get the material to soften back up. The extra moisture will continue to return the glue to the original consistency for several years when the lid stays on tight. We do not recommend using this adhesive on items that will be under water. The non-toxic ingredients dilute with exposure to wetness. You may want to avoid using this on items that go in the dishwasher or dryer. Are you an avid classic car fan? Do you love to build model airplanes? Does your job include creating small-scale representations for construction or development projects? The Bob Smith Industries duo comes with a combination of super glue and curing agent that speeds up the hardening process. The kit comes with two applicator tips. This glue increases the strength of the area around the seal when the curing process is complete. You might find this binder works best for model cars, planes, and trucks since it can join two surfaces by applying one ingredient to each side of the gluing area. Both products do not have to go on the same side of the joint. We chose the Bob Smith to be on our Top Seven list because the cure time is 15 seconds or less. The manufacturer is in the United States, and you may like that they are a sponsor of the Wounded Warrior Project. You may have a hard time choosing which one of our Top Seven Glass Glues will work best for your project since there are many helpful features with each option. We find that we keep a couple of these items around because some glues work better than others for heat, clean-up, and strength. Depending on our project, we may use a heavy-duty glue for large areas. How do you get rid of any excess glue? Unless you are using the Weldbond, we recommend letting the adhesive dry completely before you try to remove it. You can use a razor blade or a knife to cut the glue after a day or two with most of the items on our list. 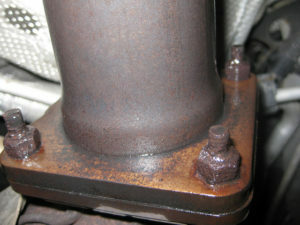 For the Weldbond, you may want to use a damp rag to wipe off any adhesive that leaks out immediately. Will the adhesive change colors over time? All of the glues on our list will remain clear once they dry. You may want to follow the manufacturer’s instructions about how to properly cure the adhesive because any dust or dirt that comes in contact with the substance as it is drying can stick to the surface and cause the glue to become cloudy. For instance, using E6000 in a wood shop may allow sawdust to coat the wet adhesive as it cures over the initial five minutes or while drying over the two to three full drying time. You might get the best results by taking the item out of the wood room before gluing it. How do I get the glue to come out of the applicator tip? You may find that it is easy to snip off the tip of the applicator with a pair of scissors, a pocket knife, or a razor blade. The top eighth of an inch is about all you need to remove for a consistent flow. Should the tip have glue dry to the top after you open it, you might want to try pulling on the dried material to see if it will come loose. If it remains stuck, you can try inserting a needle into the center of the clog. And try to remove it or poke a hole through the middle. You may also snip a little more of the applicator tip-off of the top to see if that works before you decide to replace it. All of the products on our list have various curing times. The Instabond and Gorilla Glue both set in seconds. 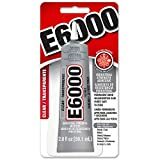 The E6000 adhesive takes five minutes to set before you can stop holding the item together giving you plenty of time to readjust anything that does not go right into place. We suggest keeping a long and short curing product around so that you have options when something breaks. Do I need industrial strength glue? Depending on whether you use adhesive to glue tiles to the wall or put together model cars may help you decide which glue to keep around. For heavy-duty projects, we suggest picking a glue-like Instabond because it will withstand as much as 5,000 pounds per square inch of pressure before the seal breaks. 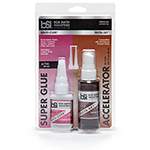 For smaller projects like crafts and building small-scale replicas, you might have the best luck with adhesives like the Bob Smith Industries Insta-Set Combo. Can you use objects glass glue in the dishwasher or microwave? 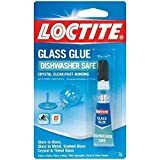 Would you need to put your favorite teacup back together or the dish that your grandmother gave you, we feel that Loctite is our favorite pick. This product is temperature resistant and waterproof. E6000 is another option that you may like for items like curtains or fabrics that you plan to wash or dry. Do you need to clamp the broken pieces together when you add the glue? None of the items on our list require clamping. You may like that these adhesives free up your workspace when you work in a small craft room or workshop. 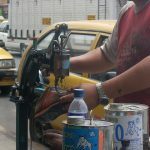 You can use your vice or clamps for other purposes while your broken items dry. Can you paint over the glue? For painting, the E6000 binder may be a good choice because it will accept paint when it is dry. You may want to make sure that you wait the entire two or three days of curing before adding the paint. Putting it on too soon could cause one or both of the materials to remain sticky. Whether you love to put together crafts, or you have a construction business that requires you to use commercial glues, we think our list may have something that you can use. 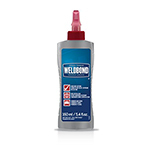 With environmentally-friendly options like Weldbond, you may feel that our Top Seven Glass Glue List has enough variety to provide a long-lasting option that is safe for use around your family or pets. To choose the right glue for your project, we suggest that you look at the curing time, surfaces, and strength of the adhesive before making a final decision.